The Specialist Library of Theology and Philosophy (Fachbibliothek Theologie-Philosophie) of Munich University Library is the largest open-access library for theology and philosophy in Germany, with around 340,000 volumes. It consists of the collections of the Faculties for Catholic and Protestant Theology and of the Faculty of Philosophy, Philosophy of Science and the Study of Religion. The Library's content covers all sub-sections of theology (Biblical, Historical, Systematic and Practical Theology), Study of Religion and Philosophy. Special collections focus on contemporary church history, Jewish studies, history of philosophy and Renaissance philosophy, logic and philosophy of science. 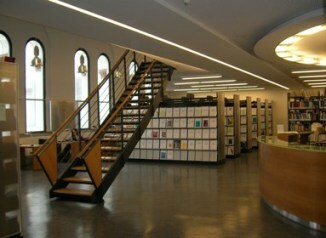 The Library of Theology and Philosophy is a reference library. The majority of its collections are freely accessible and arranged in line with the RVK (Regensburger Verbundklassifikation) classification system. All books and periodicals are entered in an electronic database and can be researched via the catalogue of the University Library. The Library website contains detailed information on the location of the library, its opening hours and its conditions of use plus contact addresses. A photo gallery offers a first impression of the Library.